You can find this FREE printable HERE! on or next to the corresponding numerals on their papers. this on a piece of paper (for younger children, you may have to dictate it for them). fit on the heart. Was their estimate too big, to small or exactly right? Youngsters will take counting skills to heart while working at this center. the cards for self-checking. Store all of the cards and heart pins in a string-tie envelope. I mailed one to a friend - now there are four. I mailed one to mother - now there are three. I mailed one to daddy and now there are two. I mailed one to Grandma - now there is one. I mailed it to Grandpa, and now there are none. through the slits in the matching numbered tubs. Cut a large heart shape for each child out of construction paper. numerals, if necessary. Have the children sit in a circle. 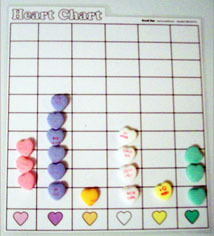 playing until each child has had a chance to do a "heart number hop." construction paper heart and drawing a tic-tac-toe grid in the center. of his hearts in a row. Tic-tac-toe, Valentine! also choose to use heart conversation candies. can use them to make patterns, sort them into groups or sort them by size. correspond with the printed number. Laminate for durability.